Cyclists bike on Prospect Park's main drive near Grand Army Plaza on Monday. PROSPECT PARK — A walk in the park is about to get even easier. Starting in the new year, vehicle traffic will be completely banned inside Prospect Park, Mayor Bill de Blasio announced Monday. The change will begin on Jan. 2 and will remain in effect “24 hours a day, 365 days a year,” the mayor said. 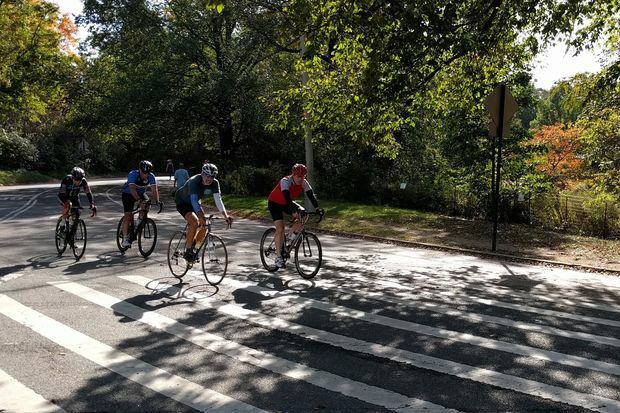 The new rules come more than two years after the city banned cars on Prospect Park’s West Drive, keeping the park’s East Drive open a few hours each morning during rush hour. At the time, residents on the park's east side fumed about the exception, while advocates continued to push the city to prohibit all cars. Over the past summer, cars were banned in the entire park as part of a trial run. 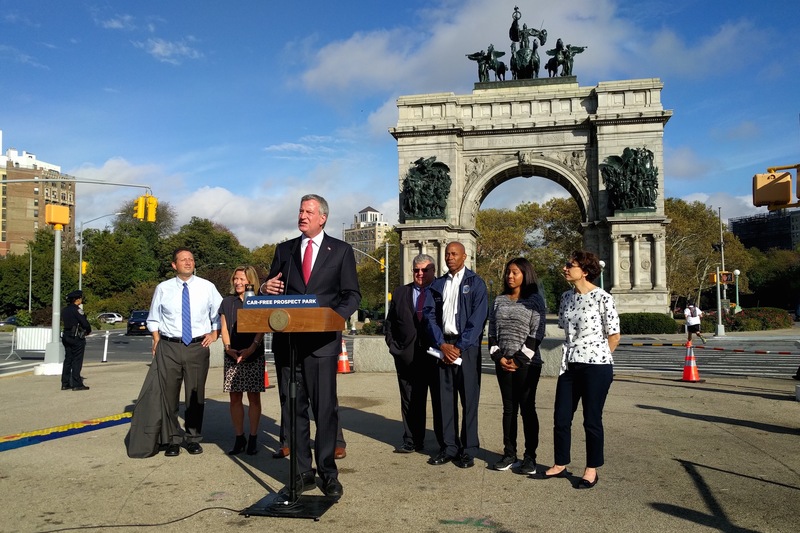 Many of those who have lobbied for the ban cheered as the mayor announced the new policy at a press conference at Grand Army Plaza on Monday morning. Cal DeJesus, a Prospect-Lefferts Gardens cyclist and street-safety advocate, watched the event from her bike. She said she and her neighbors have “been waiting for long time” for the city to nix the old traffic rules. Michael Drinkard, a Park Slope resident and advisory council member of Transportation Alternatives, said he and others in the group had been working for years to push for a complete car ban and were emotional ahead of the official announcement. “I thought about bringing my box of tissues because so many of us are so happy about today," he said. "It’s almost tears-of-joy happy." Department of Transportation Commissioner Polly Trottenberg said the agency will conduct research on traffic signal timing in areas adjacent to the park before the ban can officially begin in order to “minimize any traffic impact” in the surrounding neighborhoods, she said. The announcement comes a day after Mayor de Blasio unveiled a five-point plan to reduce traffic congestion, centering around Midtown. The traffic ban also comes at the beginning of a weeklong series of events the mayor and his administration will hold in Brooklyn as part of his “City Hall in Your Borough” initiative.